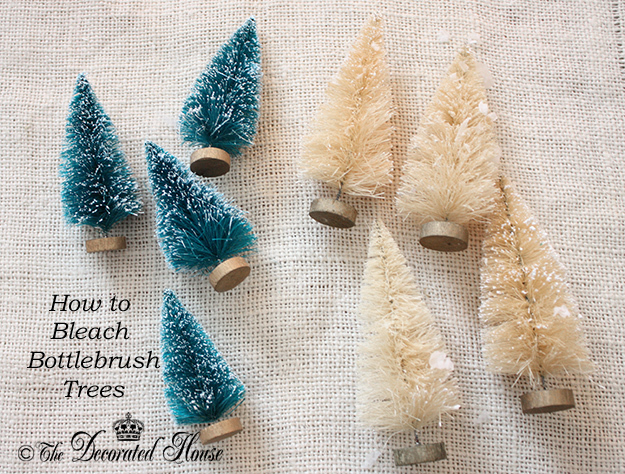 Have you fallen in love with these wonderful little bottle brush trees? I haven't seen them in their natural state of creamy off-white in stores, although they can be ordered on-line. However for just a few cents, you can create your own because you can change them very easily. The first ones I saw a couple of years ago were vintage, but today you can find them new as well. The trees on the left are how I found them. They are sold for using in those little villages people put up especially during Christmas time. Look in the area where you can buy the miniature houses and furnishings and that's where you find those strangely colored blue green trees. I started bleaching them a couple of years ago, and I haven't seen anyone coming up with a newer idea. It's all the same very simple process. After they are bleached you can use any kind of dye to make them another color like pink or aqua if you wanted to. Or just leave them pretty and natural. HOW TO: This is all you need to know! All you have to do is fill a container like a plastic or glass bowl, or a plastic tub, with water and 1/4 -1/2 cup of bleach. Let them sit until they look like the ones on the right in the picture above! Really, that's all there is to it, and what a big difference. They will match other natural bottle brush goodies very nicely. Let them dry on a paper towel or sitting outside. Because of the little character pictured below. The Dog takes on a whole new place in my decorating for even Christmas. With a face like that, you can understand! This is a special family member who has had a little influence over my decorating the last few years. He is very white, and he has a curly tail. We celebrate "The Puppy's" birthday in October, but Puppy Day is just as important and it is the day after Christmas, Dec 26th. That is the day he found us. 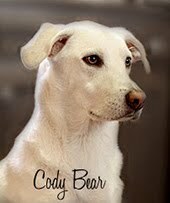 Even now it makes me smile to remember the silly story that I shared here: Cody ~ New Year, New Love. Just like with your kids, when I see that picture, I wish I could just pick up that little rascal and hold him in my lap. Well, he's about 65 lbs. now so he no longer fits in my lap. I have said before, I really didn't understand those "crazy dog" people before Cody came along. Now they all seem perfectly normal to me after all. Well, most of them anyway, and we might all be considered crazy dog people in this home now. Yes, there was the year that I went in search of the Nativity Dog. I had never seen a dog in the Christmas manger sets, and when I did, it was a mission to find one for our vintage nativity. And then... well we had three, just because. I like to collect in threes anyway. 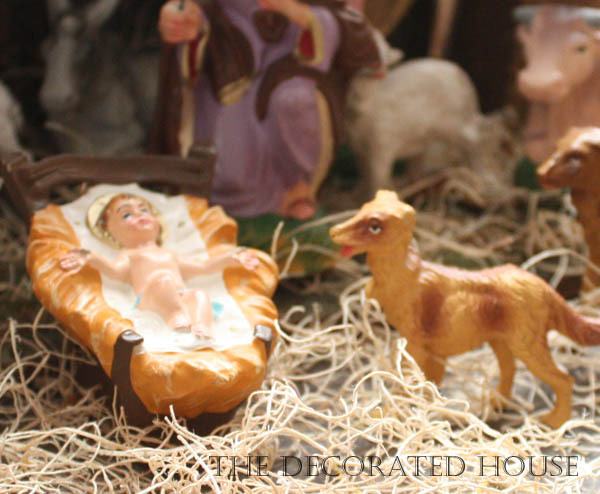 Here is the story of the Nativity Dog which you might like if you are one of those dog people, or if you like vintage goodies. So this year, The Cody Puppy was the reason for hunting down these fabulous bottle brush Lab bottle brush (sisal) dogs. None of the Pottery Barn stores in my town received a single one! Shocking for such a big store. I called their customer service; they told me how many of the dogs were in the stores in my state, and I selected one, called them up and purchased the dogs and they sent them right to my house. Free shipping on line, so they did free shipping from the store as well. If you can't find any in your stores, this is an option for you. When they arrived, I was very pleased. They are so cute! Our Cody is not a full lab, he is a rescue pup! 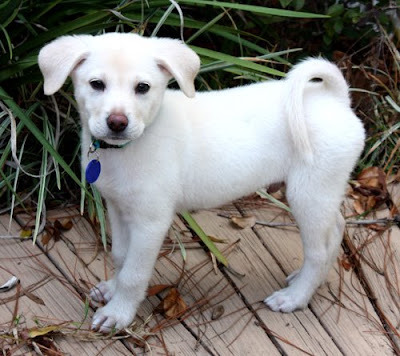 He is very white, and well, he has a perfectly curled tail which is very indicative of his personality. 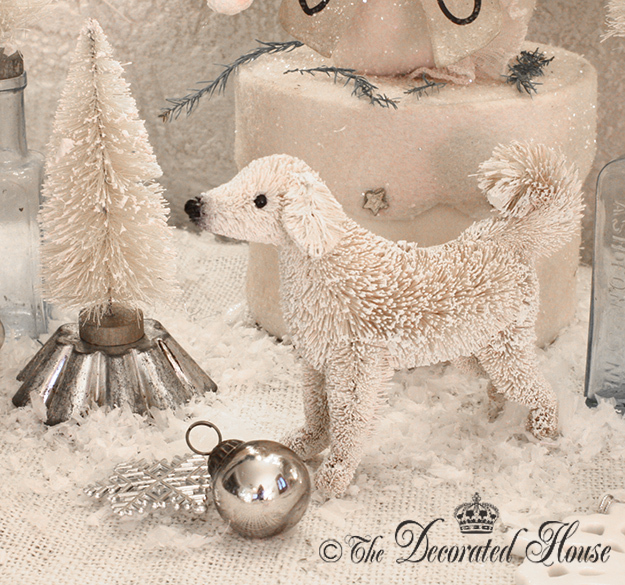 The bottle brush dogs are natural dark cream and were airbrushed with some darker highlights. I was able to bend the wire in the tail so it now has a curly tail like Cody, and add a dry brushing of white paint to make it more white like him. Totally crazy dog people, I admit it. 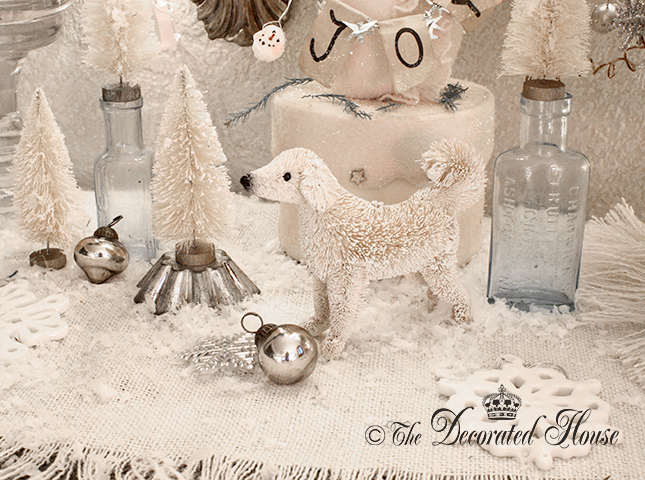 The dogs are the perfect complement to the little bottle brush trees and the wreaths as well. The arrangement on the entry table this year is very different than years before. I am enjoying the whimsical nature of it every time I walk by. The trees and dogs in real life actually have a bit more yellow to them. The first picture in this post shows a little more yellow. The last picture just above has been adjusted to show less yellow. You can make them look more white by dry brushing the tips with white paint. And you easily glitter them by painting on some glue, and the sprinkle with glitter or roll the trees in the glitter and shake off the excess. Also if you are going to bleach any bottle brush, make sure it is not plastic. The ones shown above are made of sisal. I am not sure if the plastic material would bleach, although it might. Love that sisal dog, so cute! decorations. But this one is kind of special for who he reminds me of. Thanks for stopping by! Donna - lovely as usual. Wish I was close enough to you to dog sit! What a cutie. BTW, I am busy working away doing my homage to your last year's post - that darned crown has been such a challenge and my solution my bring on the laughter! I am hoping to have it all decorated by next Sunday. j.
I bleach hundreds of bottle brush trees each year to do various things with them. In answer to bleaching the nicer trees, most do not bleach completely - just to a vintage green. I love the dog in the nativity scene.